Home › FAQ › Can You Have More Than One Major in College? Pursuing more than one major in college can be completed by motivated learners with career goals in diverse fields. As with any higher educational pursuit, important factors should be considered in making a decision to complete multiple majors as opposed to obtaining one degree with a minor or specialization. Career counselors at universities and colleges can help students make the best decisions about multiple major pathways, especially which pairings are most compatible and can influence career outcomes. Most college students declare a degree major during their sophomore year. Students often focus on one major with an accompanying minor or specialization in a particular area that benefits the major, for example accounting with a minor in computer science. This educational pathway follows a traditional route for completing a degree. However, some students may have strong interests in more than one career field or alternatively, have taken courses in a variety of areas to help them decide a career focus. For these individuals, pursuing multiple majors may be worthwhile, especially when the majors share common coursework and complement each other in skill sets and competencies, according to USA Today. Most students who do choose a multiple degree path opt for completing two degrees, or a double major, with a few completing three degrees in closely aligned fields of study. Deciding on completing more than one major in college requires careful thought about degree outcomes and personal preferences. Successful graduates who complete multiple majors in trending careers may benefit from greater career flexibility in competitive fields or greater career advancement opportunities, which can translate to higher lifetime earnings, according to Vanderbilt University. On the flip side, a multiple major usually requires greater time, effort and expense up front than completing a traditional one-degree program. Students should consider these aspects of multiple majors and make the best decision for their degree pathway based on personal learning styles, desired career outcomes and the ability to follow through with increased academic work loads. Psychology – A psychology curriculum builds communication and relationship skills that translate into working cooperatively with clients and colleagues. Psychology degrees often pair with degrees in criminology, sociology, education, business or healthcare. Computer Science – Today’s digital information age requires that data be handled ethically and securely. Computer science degrees often complement programs in business, finance, healthcare, the justice system, homeland security, communications or STEM. Teaching – Teaching offers those in fields like history, art, music, foreign language or business alternative employment opportunities within education to explore career possibilities as instructors in their field. Economics – Economics considers the infrastructure that influences financial growth and public welfare. It pairs well with degrees in accounting, finance, public health, public policy, statistics or global politics. Communications – Getting the message out effectively underlies many employment sectors, so communications is a natural companion to degrees in journalism, marketing, public policy, media, technology, education or graphic design. 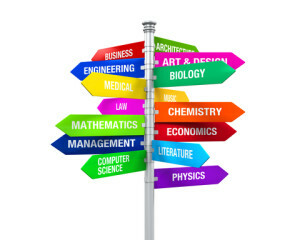 Deciding whether to pursue a multiple major or single major program of study starts with making informed degree plan choices. For those who desire degree outcomes leading to broader employment possibilities, considering more than one major in college may offer future career flexibility.